We have been really busy lately. What with days out, family parties, friends parties, and the lovely weather calling for us to be outdoors it seems like an age since we spent the day at home doing nothing. Over the weekend I was delivering leaflets for a friends business and Gordon and the kids came along to help. We were out for 2 hours at a time and the kids loved “being the postman” but it was hard work. Yesterday we spent the whole day at Garsons Farm with friends, We took a picnic and had a really great time picking raspberries, strawberries and carrots, but by the end of the day we were all shattered. So today was a day for some down time. Today we stayed at home. This morning Jasmine and Thomas played with their Lego. 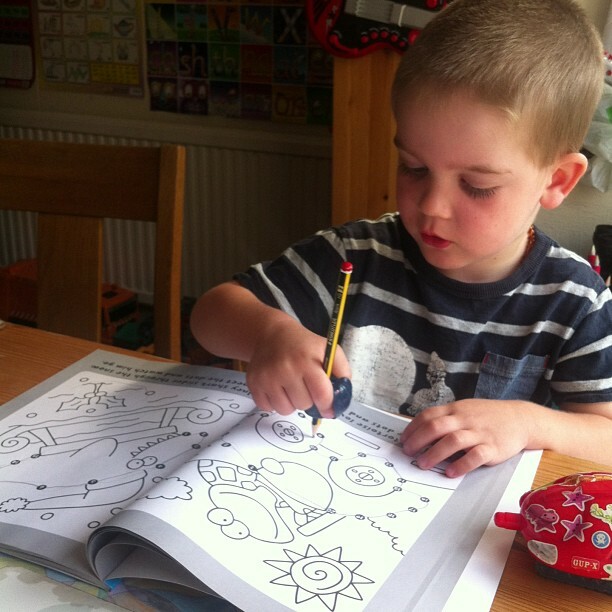 They were playing really nicely upstairs so I spent some time with Ben, who wanted to do colouring and dot-to-dots. After lunch all three continued to play together so I got on with some web/admin stuff. They seemed to be playing something to do with Star Wars as it definitely involved Lightsabers but also seemed to need several empty toy boxes, so toys were tipped out, and chairs were moved into the middle of the room. 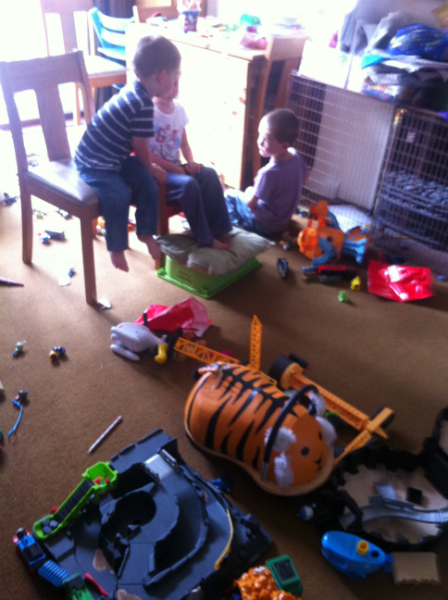 I ignored the mess being created as they were so happy playing their game! After a while they went to play upstairs and I could hear a lot of running around and things being moved but today I didn’t want to stop them. Today they needed to be able to play at home. They started playing Hide and Seek. They hid in wardrobes, under duvets, under beds, behind me, under the dining table, behind the sofa and in corners. It was great watching them and I admit I did give them a few ideas of new hiding places! But then I noticed the signs. If I didn’t stop them and begin the long tidy up session it would never get done. They were all getting tired and silly-ness would soon overtake fun. With 3 young kids, once they get like that it is very hard to stop it. So before it got out of control we started putting things away. Thomas and Jasmine made a good start but after a while they needed encouragement so I turned it into a race of sorts. I got a bag that I was going to put toys in to give away and they had to beat me and put the toys away before I got to them! It actually worked really well as I picked the tricky to put away toys – you know the ones that only fit in their box one way and one way only – and I couldn’t work out how they went! Seriously, I can never remember and these toys drive me mad! I really would love to give them away! Once downstairs was tidy the kids watched some TV while I cooked dinner. They watched Deadly 60, possibly their favourite programme! All three love it and we have several (and more) episodes on the Sky planner for them to choose from. After dinner I asked Ben to help me get the washing in from the line outside and Jasmine and Thomas went to tidy their bedroom. I had been to have a quick look upstairs so was fully expecting them to require some help with the tidying. When I first went to check on the progress I found them playing with Lego! But after a nudge in the right direction they eventually did a really good job. Hopefully our day at home today has helped recharge the kids a little. They got a good long play with their toys and at then end of the day everything was tidied away and the house actually looks quite nice and not like a toy factory explosion! We’re all ready to start again tomorrow!